Shooter identified as Larry Steven McQuilliams. camera (Jim Vertuno/AP Photo) Police tape marks off the scene after authorities shot and killed a man who they say opened fire on the Mexican Consulate, police headquarters and other downtown buildings on Nov. 28, 2014 in Austin, Texas. In the distance, police cars surround the suspect's vehicle parked near the Interstate 35 overpass. A gunman in Austin, Texas, tried to burn down the Mexican consulate and fired more than 100 rounds at city buildings and at a police officer early today before dying of a bullet wound. It was not immediately clear whether the shooter, identified by ABC News as Larry Steven McQuilliams, 49, was killed by police or shot himself, authorities said. Austin Police Department Assistant Chief Raul Munguia, speaking at a news conference, said residents reported hearing shots at 2:22 a.m., and calls continued to come in as the suspect was “attacking government facilities.” Police said the timing of the attack was especially dangerous because bars were closing in downtown Austin, sending potentially thousands of people onto the streets. One male suspect is deceased. We are in process of securing scene. After an officer fired at the suspect, police noticed that he was wearing a vest, and a bomb squad was called to the scene, Munguia said. 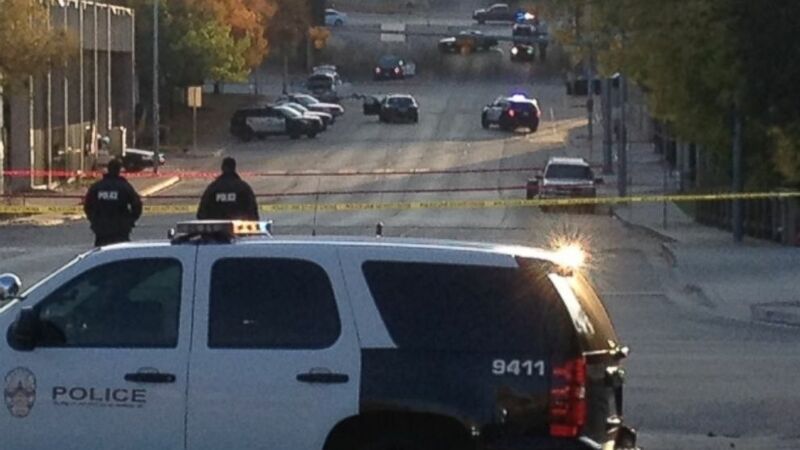 No police officers were injured, but Austin’s Police Department headquarters was evacuated. The suspect tried to set the Mexican consulate ablaze and successfully ignited a fire, but it extinguished before the consulate was significantly damaged, police said. He also unleashed a barrage of bullets at the Austin Police Department, a federal courthouse and a downtown bank, authorities said. While he was firing “a lot of bullets” at police headquarters, an officer saw him and returned fire, according to police. McQuilliams died at the scene. Authorities executed a search warrant at his apartment today and have reviewed his social media accounts, but so far a motive is still unclear. The FBI is “assisting” with the investigation, police said. McQuilliams was arrested in 1992 by the Austin Police Department for aggravated robbery with a deadly weapon, but the case was dismissed, according to public records. There was an active shooter targeting multiple downtown buildings, including APD Headquarters. This resulted in an Ofc. Involved Shooting.